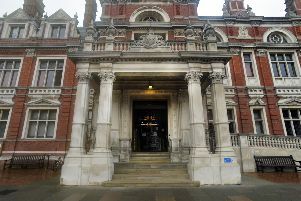 A heartbroken woman from Eastbourne walked in to the sea to drown herself the day after her long term partner died of cancer, an inquest has heard. The body of facilities manager Kirsten Grigat, who was known as Kiki, was washed up on a beach close to the Holywell Tea Chalet on November 2 last year and discovered by Sarah Cheesebrough during an early morning walk. An inquest today (Thursday) at Eastbourne heard 51-year-old Miss Grigat, of Parkway, had told family members she would be unable to live without Peter Harrison, who she had been in a relationship with for 31 years and had been diagnosed with terminal cancer. Mr Harrison died at the couple’s home on November 1 and the morning after his death, German born Miss Grigat took some of his morphine and walked into the sea. Dr Alice Sharma, a GP at Enys Road Surgery in Eastbourne who treated Mr Harrison, said she was aware Miss Grigat had “found it difficult to come to terms” with her partner’s terminal cancer diagnosis and got very distressed when talking about the future. The inquest Mr Harrison’s sister Sally Burchill had gone to stay with Miss Grigat the night he passed away and when she woke up the following morning, Miss Grigat was missing and she notified police. By that time Miss Grigat’s body had been discovered and recovered from the beach by coastguards. Eastbourne Police Detective Sergeant Ross Bartlett was called to the beach to investigate and said there were no suspicious circumstances. In a statement read to the inquest DS Bartlett said he learnt the couple had been together for more than 30 years and were devoted to each other. “It appears Miss Grigat just walked into the sea and drowned,” said the detective. Recording a verdict of suicide, East Sussex coroner Alan Craze said it was quite clear Miss Grigat was unable to accept her partner’s death. It’s a tragedy,” said Mr Craze.